Babri Masjid, the structure which was demolished on 6 December 1992 was not constructed atleast until 1717 CE. This is the official map of Rama Janmabhumi (Ayodhya) dated 1717 CE. It is now in City Palace Museum, Jaipur. This map clearly shows that Ram Temple existed atleast till 1717 CE, though islamist occupation happened earlier. The map belongs to Jai Singh II (or “Sawai Jai Singh”), a Rajput noble in the Mughal court who purchased land and established a Jaisinghpura in the area surrounding the mosque in 1717 (as he had also done in several other Hindu religious places). 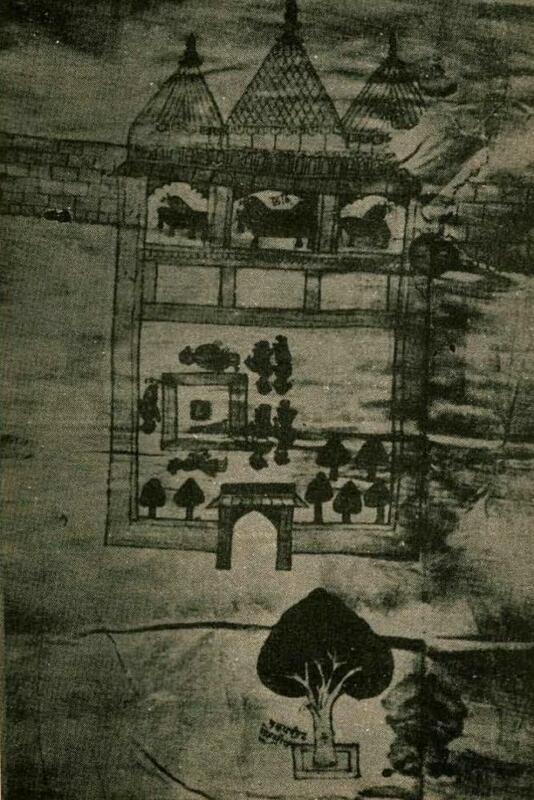 The documents of Jai Singh preserved in the Kapad-Dwar collection in the City Palace Museum of Jaipur, include this sketch map. It shows an open court yard and a built structure with three temple spires (sikharas) resembling later Babri Masjid with three domes. The courtyard is labelled janmasthan and shows a Ram chabutra. The central bay of the built structure is labelled chhathi, which also denotes birthplace. As hindus were prohibited from entering the main chhathi, they built a Chabutra in front yard and consecrated murti of Lord Rama. Sketch map also shows hindus perfoming pradakshinas around Rama Chabutra inside the site. 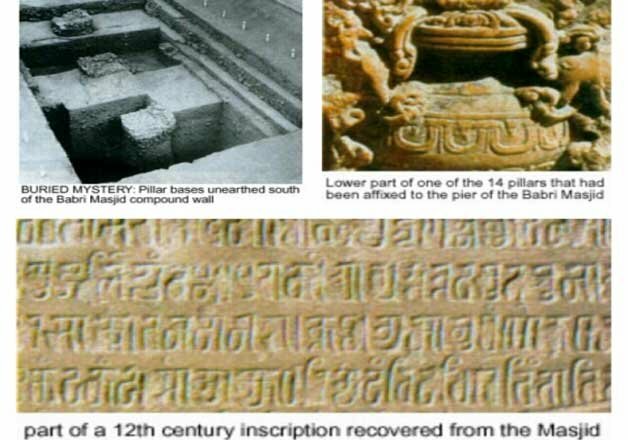 There are inscriptions on the Babri Masjid premises found in the 20th century state that the mosque was built in 935 AH (1528–29 CE) by Mir Baqi in accordance with the wishes of Babur. However, these inscriptions appear to be of a more recent vintage. So, the proposed history that Babur ordered to build a masjid in 1528-19 CE is fake ! Baburnama (Chronicles of Babur) does not mention either the mosque or the destruction of a temple. Ramcharit Manas of Tulsidas (1574 CE) and Ain-i Akbari of Abu’l-Fazl ibn Mubarak (1598 CE) made no mention of a mosque either. 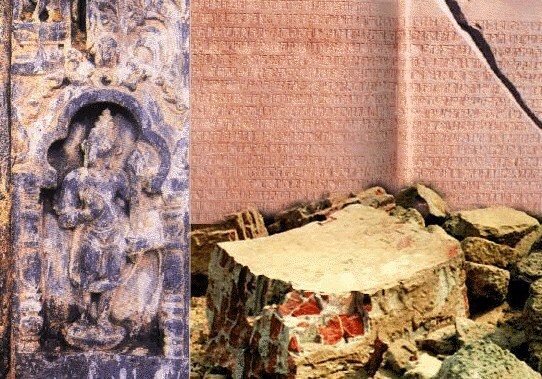 William Finch, the English traveller who visited Ayodhya around 1611 CE, wrote about the “ruins of the Ranichand [Ramachand] castle and houses” where Hindus believed the great God “took flesh upon him to see the tamasha of the world.” He found pandas (Brahmin priests) in the ruins of the fort, recording the names of pilgrims, but there was no mention of a mosque. Thomas Herbert described in 1634 CE the “pretty old castle of Ranichand built by a Bannyan Pagod of that name” which he described as an antique monument that was “especially memorable“. He also recorded the fact of Brahmins recording the names of pilgrims. European Jesuit missionary Joseph Tiefenthaler, who lived and worked in India for 38 years (1743–1785 CE) and wrote numerous works about India, visited Ayodhya in 1767 CE. Johann Bernoulli translated his work Descriptio Indiae (in Latin) into French, published in 1788 CE. According to this account, Aurangzeb (r. 1658–1707 CE) had demolished the Ramkot fortress, including the house that was considered as the birthplace of Rama by Hindus. A mosque with three domes was constructed in its place. 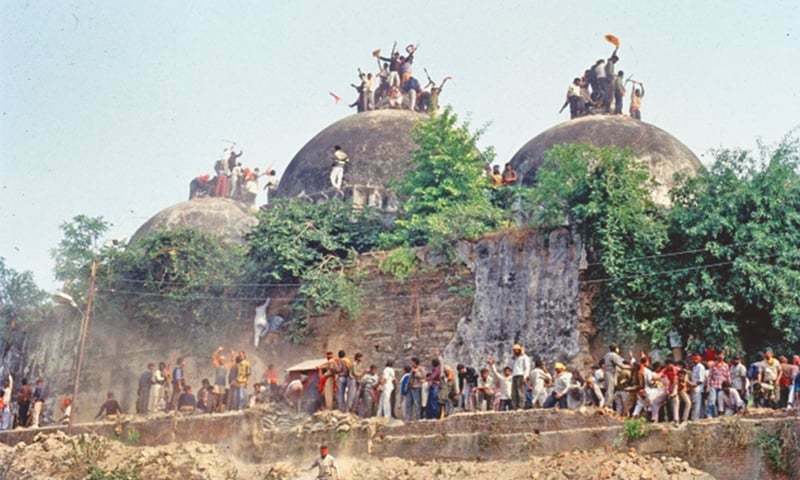 The 3 dome construction demolished on 6 December 1992 was built by Aurangzed after demolishing the Ram Mandir. Francis Buchanan-Hamilton did a survey of the Gorakhpur Division in 1813–14 on behalf of the British East India Company. His report states that Ram Mandir destruction happened due to furious zeal of Aurangzeb. In 1838, British surveyor Montgomery Martin wrote that the pillars in the mosque were taken from a Hindu temple. The Masjid was called as Masjid-E-Janmasthan for many years. In 1853 CE, a group of armed Hindu ascetics belonging to the Nirmohi Akhara occupied the site, and claimed ownership of the structure. Periodic violence erupted in the next two years, and the civil administration had to step in, refusing permission to build a temple or to use it as a place of worship. In 1855 CE, after a Hindu-Muslim clash, a boundary wall was constructed to avoid further disputes. It divided the mosque premises into two courtyards; the Muslims offered prayers in the inner courtyard. The Hindus offered their prayers on a raised platform, known as “Ram Chabutara“, in the outer courtyard. n 1883, the Hindus launched an effort to construct a temple on the platform. After Muslim protests, the Deputy Commissioner prohibited any temple construction on 19 January 1885. On 27 January 1885, Raghubar Das, the Hindu mahant (priest) of the Ram Chabutara filed a civil suit before the Faizabad Sub-Judge. In response, the mutawalli (Muslim trustee) of the mosque argued that the entire land belonged to the mosque. On 24 December 1885, the Sub Judge Pandit Hari Kishan Singh dismissed the suit. On 18 March 1886, the District Judge F.E.A. Chamier also dismissed an appeal against the lower court judgment. He agreed that the mosque was built on the land considered sacred by the Hindus, but ordered maintenance of status quo, since it was “too late now to remedy the grievance“. A subsequent appeal before the Judicial Commissioner W. Young was also dismissed on 1 November 1886. On 27 March 1934, a Hindu–Muslim riot occurred in Ayodhya, triggered by cow slaughter in the nearby Shahjahanpur village. The walls around the Masjid and one of the domes of the Masjid were damaged during the riots. These were reconstructed by the British Government. A local legend in Ayodhya states that the city was re-discovered by Vikramaditya (101 BCE – 19 CE), After having been lost for centuries. Vikramaditya started searching for Ayodhya, and met Prayaga, the king of tirthas (Prayaga personified). Guided by Prayaga, Vikramaditya marked the place, but subsequently forgot its location. A yogi told him that he should let loose a cow and a calf: Ayodhya would be at the place where milk starts flowing from the cow’s udders. Using this advice, Vikramaditya managed to re-identify the site of ancient Ayodhya.